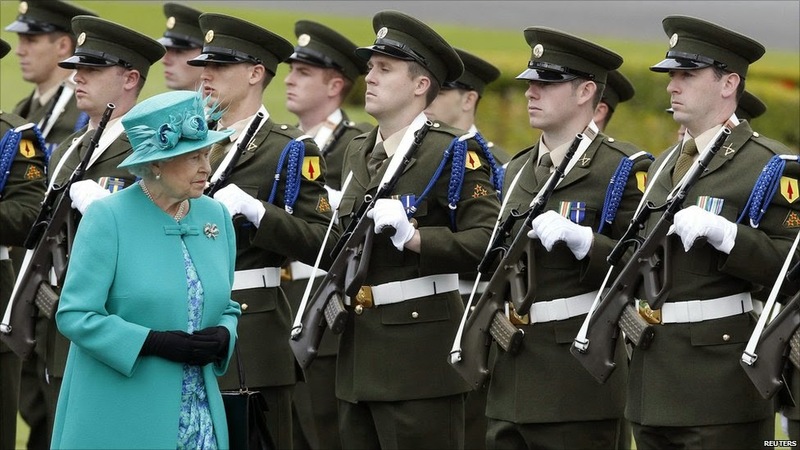 A History of the Irish Army. John P. Duggan. Gill and Macmillan, Dublin, 1991. pp 373. SB. I read the above history shortly after it was published. I made notes at the time but I failed to write a review about it nor did I think of writing my comments to the author. It was only in the late 1990s, after I had reviewed a few books for the Irish Times that I adopted the habit of reviewing all books I read irrespective of their subjects and largely for my own edification. This was a major undertaking for a fledgling army and the fact it was successfully completed and presumably fulfilled its purpose shows that first class organisers had come on board. It was this comment that induced me to check Duggan’s book and to provide my views about the army during the War of Independence and Truce. I reviewed the comments I had made at the time of reading his text. There was no mention of the General Headquarters Staff before 1922 during the War of Independence and the prolonged Truce preceding the passage of the Treaty in January of that year. The seeds of a national army were sown, not in 1922 as implied by the author but earlier with the setting up of the GHQ staff in March 1918. Its establishment lead to the gradual evolution of an army, through the close association between GHQ and its members and the active volunteers who fought during the war. From its earlier days GHQ was designed along lines which might lead to a peacetime army committed to the democratic institutions of the state. It is clear from reading the Valiulis biography and my own biography of my father that, despite the insurgent nature of the war against the British, the role of the GHQ staff was organised and developed along the lines of a national army devoted to the support of a democratic nation. Duggan’s failure to include the first four years of GHQ leaves an important gap in his account of the genesis of our military forces and can only be explained by the failure to consult the Mulcahy papers which were deposited in the UCD Archives shortly before Mulcahy’s death in 1971. Of course Duggan may have been at a disadvantage in that my father’s biography had not yet been published by Maryann Valiulis and he may have been unaware of the UCD papers and may have been over influenced by the absence of reference to GHQ which was a feature of the early 1926 Collins biography by Beaslai. 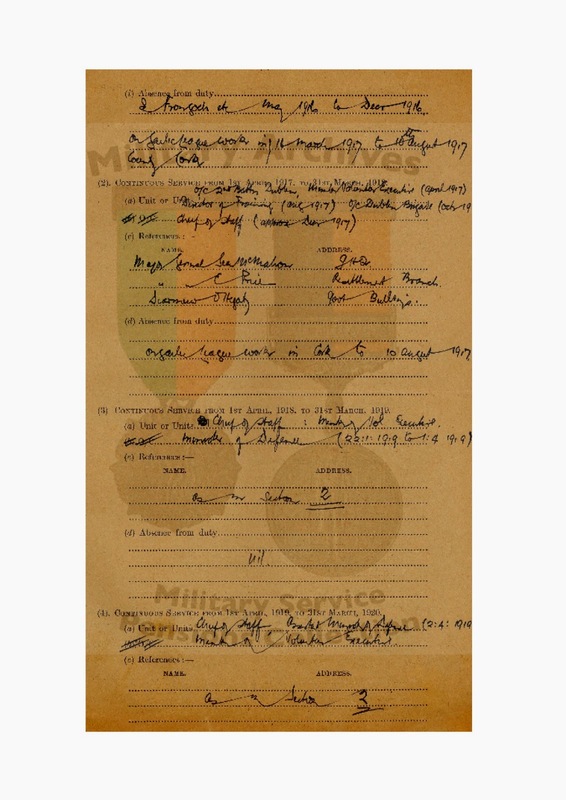 The Mulcahy papers included the details concerning the army from November 1920 until March 1924 at the time of the Army Mutiny. These papers had been kept by my father in his home and were not available to historians until 1971. 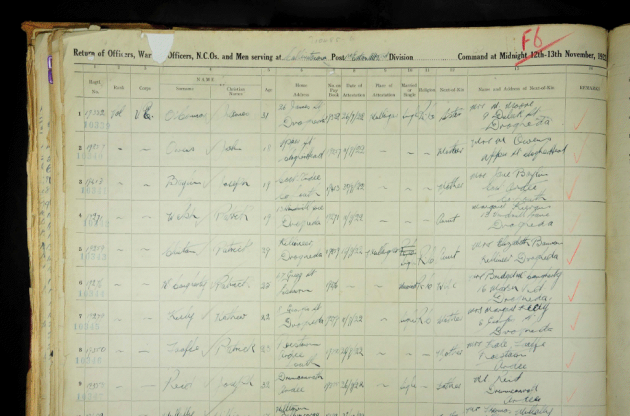 His papers before November 1920 were captured by the British forces and were subsequently destroyed by a German doodle bomb in London during the World War. The debate (that is, the Treaty debate in January 1922 - RM) divided the country and split the army which had not yet become accustomed to subordinating itself to the civil authority. Richard Mulcahy denied the claim that the army was not subordinate to the Dáil. 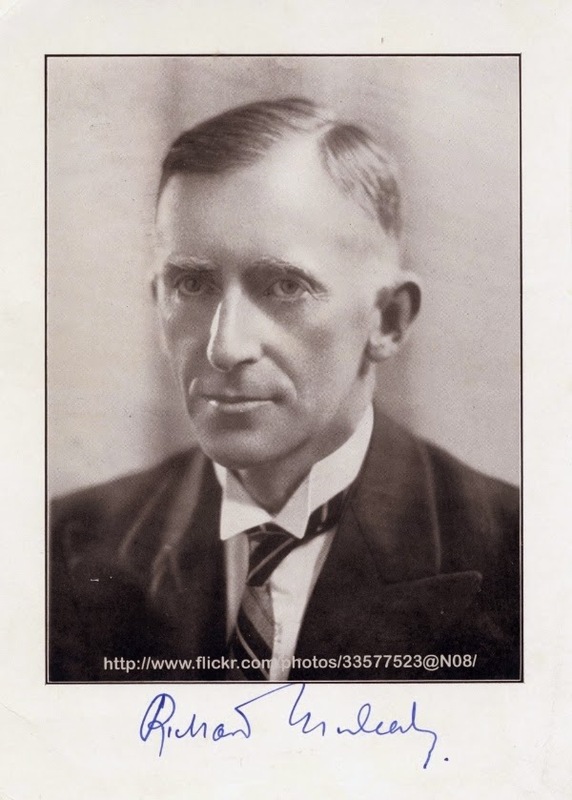 As chief of staff he kept in close touch from 1918 to January 1922 with Cathal Brugha, the Chairman of the Military Executive and subsequently Minister for Defence in the two Dála before the Treaty. No complaint about military policies was ever raised by Brugha apart from some minor events which were unrelated to policy and De Valera’s unrealistic comments about military policy after his return from America were not supported by either the chief of staff or the Dáil. Mulcahy was a member of the Dáil as was Collins and other leading volunteers. 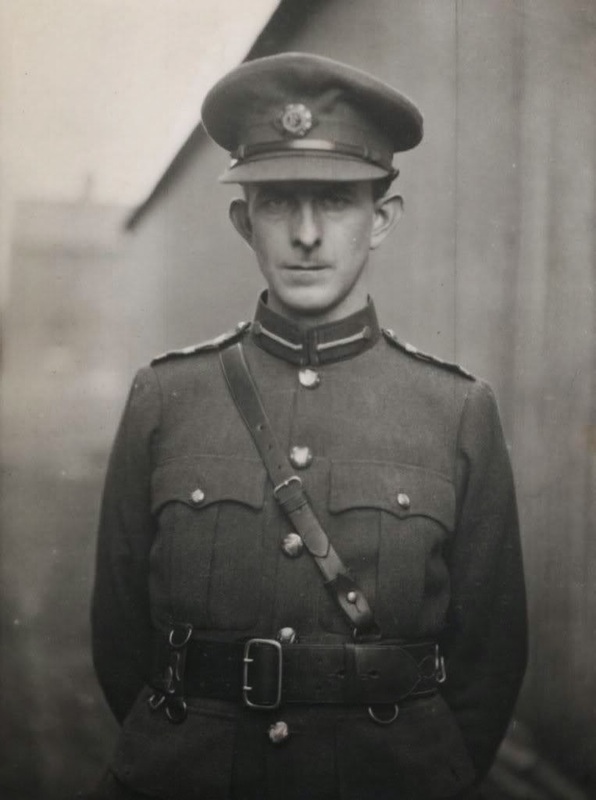 He was appointed Minister for Defence (while continuing as Chief of Staff) in the interim first Dáil from January to April 1919 while Brugha stood in as chairman in Dev’s absence in jail in Britain. Collins was Minister for Finance during the period of the War and the Truce. 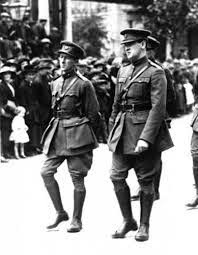 Mulcahy and Collins at Arthur Griffith's funeral. In addition, Griffith never disapproved of military policies. He was greatly regarded by my father and he acted as president of Sinn Féin while Dev was away in the United States. Griffith remained a close friend of my father and fully approved of his role as chief of staff. Even when Brugha had arranged to visit England with a view to assassinating British politicians (!) and when he and Dev proposed the attack on the Custom House the army assisted despite the disapproval of the chief of staff, Collins and other army leaders. It is surely ignoring the circumstances of the army/political relationship during and after the War of Independence to suggest military policies which were not approved of by the political leaders and the Dáil. And no army could have responded so strictly to the acceptance of the newly elected Fianna Fáil government in 1932 just ten years after the bitterness of the Civil War and the role of the National Army in their defeat. It would be inconsistent with Mulcahy’s character as head of the army to act without the full approval of the elected representatives of the people. He always spoke of his ambition for Ireland’s future. He simply desired that we in Ireland should be absolutely free to run our own country. He supported the Treaty because he realised that the agreement provided us with that objective. He had no concern about the symbol of the Crown. Indeed he was subsequently always an admirer of the Commonwealth. He was aware that nothing could be done at the time to alter the intransigence of the Unionists in the North and that partition was already a fait accompli at the time of the Treaty; nor did he think that the retention of the three ports by the British prevented us from running our own country. Indeed he thought that a full break with Britain would have aggravated the situation as regards the North and future integration with the South. We in Ireland can be justly proud of our army and its dedicated apolitical role, a dedication which was initially born in the backrooms and secret conclaves of the Irish Volunteers long before the foundation of the Irish Free State. It was the Crown, the North and the ports which were the stumbling block for those intransigents who were obsessed by the rhetoric of the Republic and who precipitated the Civil War. My father, like all his colleagues in the Free State Cabinet, could never forgive De Valera for his lack of leadership which led ultimately to civil strife. Nor should the Army in its understandable pride and admiration of Collins forget that the seeds of the success of the Army, its devotion to democracy and its strict adherence to a neutral political role, were laid in 1918 when the GHQ was established. A perusal of the Mulcahy papers and his biographies leaves no doubt that the early military leaders were committed to its role not only as the creater but as the defender of independence and of a democratic nation. 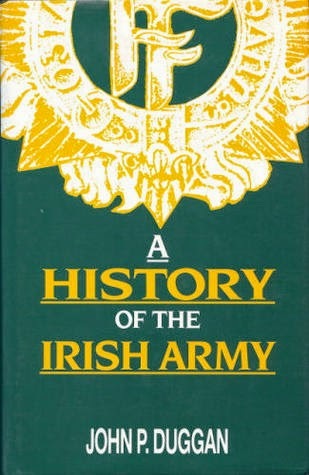 Despite my reservations about the author’s failure to include the pre-Treaty history of the army and its influence on its remarkable non-political role in our national affairs, I can say that his account of our military standing in internal and international affairs brings credit to the Irish Army and to his scholarship. However, we need a new history of the National Army to bring us up to date on internal and external affairs and to provide more information about the early and seminal years which were not fully included in this volume. The army is merely an instrument of Policy in the State: As such it has no title to express opinions on public affairs and in fact should none.